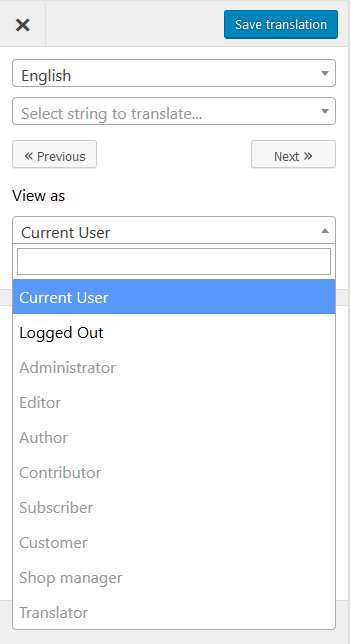 The Translation Editor can be accessed from both the Settings page or from the Admin bar. 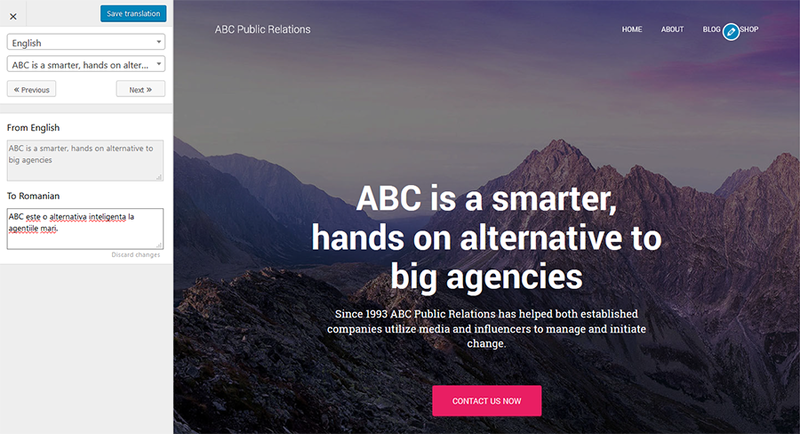 It’s a simple interface that allows you to translate your website page by page. The main functionality of the translation editor is the possibility to translate string by string your entire page. Simply hover over a string, click the edit button that appears on the left and translate your string in the left translation interface. Selecting a new language will allow you to navigate your site in that particular language, making it a lot easier to notice untranslated strings. Not all detected string are visible in the page. Strings like SEO Title, meta description and sometimes other strings that don’t have a the edit button can be found by simply searching the list of strings. You can Browse your website from the translation editor as your self (logged in) or as a non-logged in user. This makes it easy to translate pages that are dynamic based on the logged in / non-logged-in status. You can navigate as a different user role with the Browse as Role Addon. The SEO Addon is only available in the paid versions of the plugin. 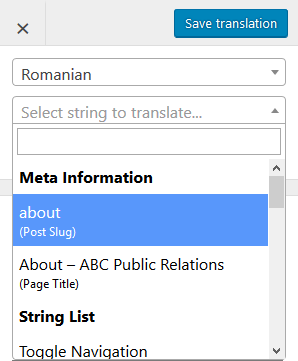 Currently we support translating the page title and slug of posts, pages and custom post types. To translate larger blocks of html with a single translation you need to join multiple translation strings into a translation block. Merging a string with its parent paragraph is done by hovering a string that you want to join with its surrounding strings within the parent. Click the merge button shown for the hovered string. The block that will be merged is now highlighted in the live preview. The full text containing the HTML structure, is now shown in the left sidebar where you can optionally add a translation. Click the Save Translation button to confirm the creation of the translation block. Now the translation block will be translated as a whole. You can edit the translation by clicking the Edit button . When writing a translation for the translation block, be careful to insert a valid HTML in the translation block. Note: The merging icon will be available only to the strings compatible with translation blocks. Merging is allowed within block elements such as paragraphs and divs. Content received through wp-ajax requests is also compatible. To go back to translating individual strings from a created translation block you need to hover it and click the Split button . A pop-up will appear asking you to confirm separating the translation block into smaller pieces. The translation of the whole translation block will be available anytime you decide to merge back again.